Rabbi Yitzchak Ginsburg, questioned by police because of a book he prefaced, danced and sang with students after his released. INN TV was there. Rabbi Yitzchak Ginsburg, head of the Ohd Yosef Chai (Joseph Still Lives) yeshiva in Samaria, danced and sang with his students Monday after he was questioned by police in central Israel over a book in which he wrote a preface. Rabbi Ginsburg told Israel National News TV that the police don’t even know what is written in the book, which raised suspicions among authorities that he was inciting followers. The volume is entitled "Torat HaMelech" and was written by Rabbi Yitzchak Shapira. The book includes in depth explanation of self-defense according to Torah and the importance of a Jewish soldier saving his life or the life of a fellow Jew even if the consequence is killing those who threaten Jewish lives. 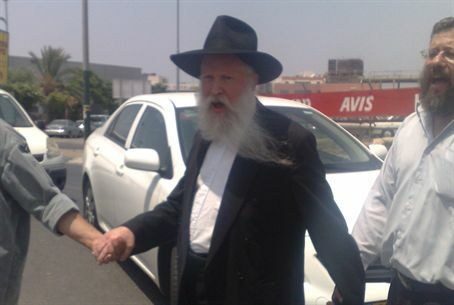 Rabbi Shapira has already been questioned and released without any charges being laid. Rabbi Ginsburg said that one lesson to be drawn from the questioning by police is that “we have to clarify ourselves even better and we have to reach the general public. We have to address and relate to the public in pleasant ways in order to give the light of the Torah and the true ethics of the Torah to the general public and the whole world." The Ohd Yosef Chai yeshiva is located near Shechem, where the Biblical Joseph was sent by his father Yaakov to meet his brothers who were shepherding flocks. The yeshiva is named after Joseph. Yaakov exclaimed his son still was alive after his brothers sold him to Egypt and then brought false evidence to their father to show he has been killed by an animal.